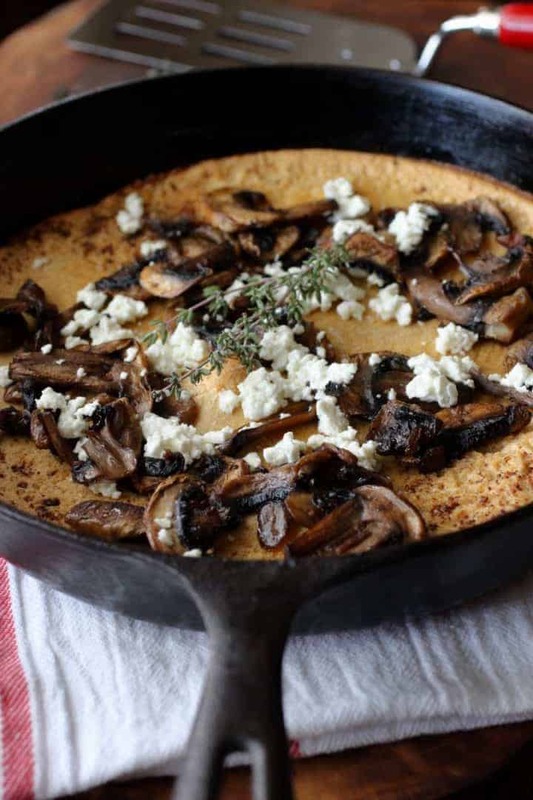 Mushroom Goat Cheese Dutch Baby is easy to make and protein-rich with no-added sugar. Pancakes aren’t just for breakfast. With a green salad, this recipe would be great for dinner. A Dutch Baby pancake, sometimes called a German pancake, is a puffy, family-sized hybrid pancake. It is similar to a popover because the thin batter puffs in the oven and seems to “pop over” the sides. Usually. Sometimes there is less puff but looks isn’t everything. 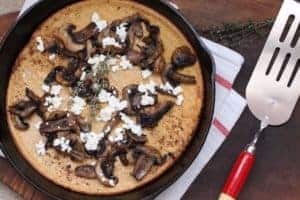 Rather than pouring batter on the griddle and flipping each pancake, this batter is baked in a hot, sizzling skillet, leaving you some time to pour a cup of coffee and set the table. 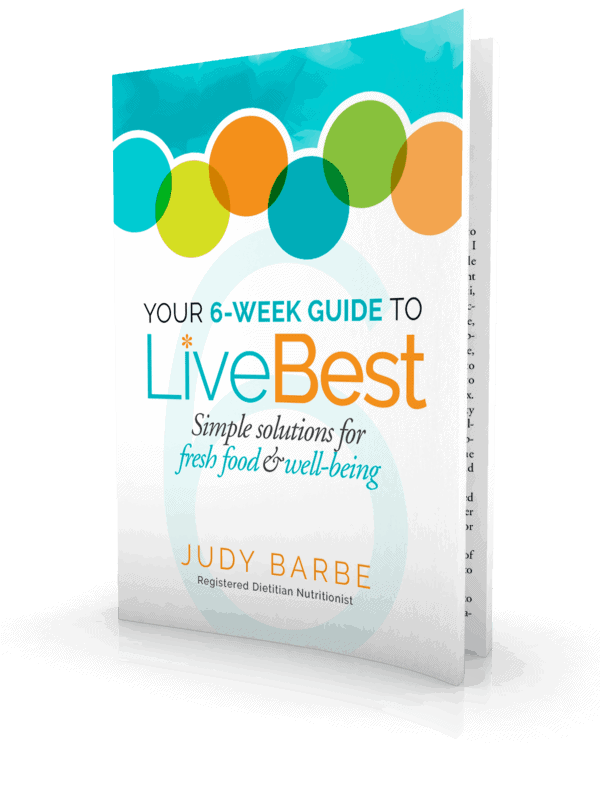 You’ll want to be ready to eat because just as quickly as it rises in the oven, it deflates when you take it out of the oven. Blend the ingredients in a blender for about 30 seconds to make sure the flour gets hydrated. Then let the batter rest while the mushrooms are cooking and before pouring it in the hot pan. If you don’t have a blender, a food processor will work and so will a bowl and whisk. You just need to make sure to mix it well with no lumps. I have used cast-iron and stainless steel skillets. to make Dutch Baby. I’ve even used a pie plate. Just make sure the pan and handle are oven-proof. 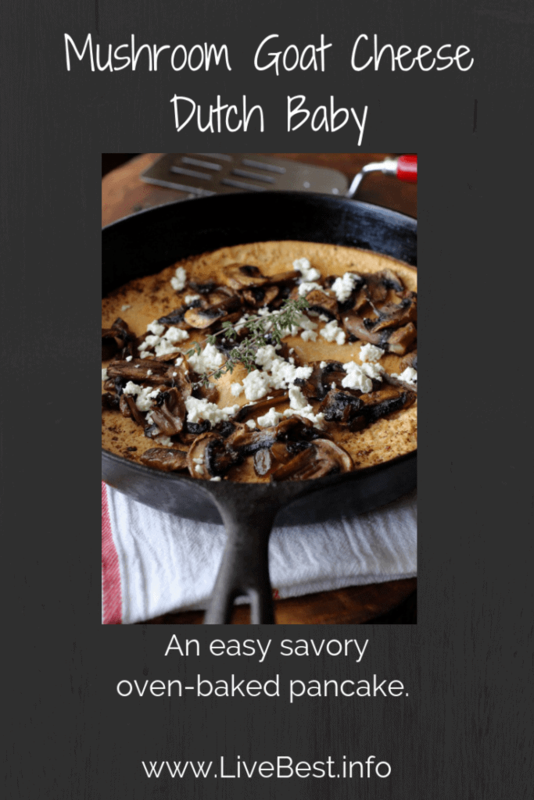 You’ll see when you read the recipe below to pull the pan from the oven and remove the mushrooms, but you might forget (like I did) that the handle is hot and, after removing it from the oven, grab with your bare hand when scooping out the ‘shrooms. Don’t do that! Pancakes aren’t just for breakfast. With a green salad, this recipe would be great for dinner. Cook’s Note: I keep a log of goat cheese in the freezer so I can whittle off chunks when I want a flavor boost. At the store, look for mushrooms that are smooth and firm with tightly closed caps. If the gills under the cap are showing, the mushroom is old. Fresh mushrooms should be stored in the refrigerator, preferably with air circulating around them. If you can, lay them out on a tray in a single layer and cover with a damp paper towel, for ideal storage. 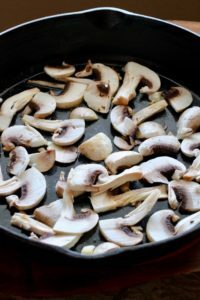 Mushrooms absorb water, so rather than rinsing them, the best way to clean them is to rub them with a damp paper towel. Slice the mushrooms in similar sizes so that they cook evenly. Fresh mushrooms don’t freeze well, but if you cook more mushrooms than you need, pack them in a freezer container to use later. Blend eggs, milk, Siracha, flour, salt, pepper, thyme in a blender for 30 seconds. 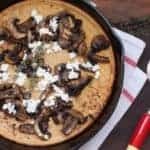 Place butter, oil and mushrooms in 9- or 10-inch oven-proof pan. Heat oven to 425°F. When oven reaches temperature, swirl pan, cook mushrooms 5 minutes more. Remove pan from oven and spoon mushrooms from pan, leaving as much butter mixture as you can. Pour egg mixture into hot pan. Bake 15 minutes. Remove pan from oven. 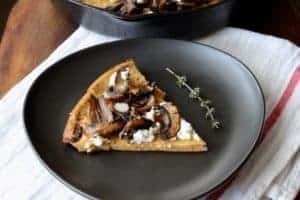 Sprinkle mushrooms and goat cheese over pancake; return to oven and bake 5 minutes more. Cut into large wedges to serve.